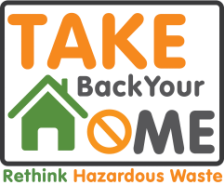 TAKE Back Your Home is a partnership between Recycling and Solid Waste Districts, Soil and Water Conservation Districts, Storm Water Districts and Public Health Districts in Adams, Butler, Clermont, Hamilton and Warren Counties in Ohio and Boone, Campbell and Kenton Counties in Kentucky to help you Rethink Hazardous Waste. Teach yourself to find the correct quantity needed for your project. For example, measure your lawn’s square footage and purchase only the fertilizer you need). Alternatives available for hazardous products? For example, you can clean a drain with vinegar and baking soda rather than buy a drain cleaner. Know how to store the materials properly. For example, tape the ends of used 9-volt batteries to avoid starting a fire. Explore disposal options. Rather than throw away used motor oil, many oil change businesses will accept oil for recycling. Household hazardous waste can have a negative impact on the environment and can create health and safety risks for your family and trash haulers if improperly stored or disposed. Common household hazardous waste includes pesticides, herbicides, motor oil, propane tanks, drain cleaners, and oil-based paint. “TAKE Back Your Home” is a cooperative program organized by Recycling and Solid Waste Districts, Soil and Water Conservation Districts, Storm Water Districts and Public Health Districts in Adams, Butler, Clermont, Hamilton and Warren Counties in Ohio and Boone, Campbell and Kenton Counties in Kentucky to help residents with hazardous waste and help make each home as toxin free as possible. ​Based upon the acronym “TAKE,” residents will find a hierarchy of ways to handle hazardous waste. “TAKE Back Your Home” is a cooperative program organized by Recycling and Solid Waste Districts, Soil and Water Conservation Districts, Storm Water Districts and Public Health Districts in Adams, Butler, Clermont, Hamilton and Warren Counties in Ohio and Boone, Campbell and Kenton Counties in Kentucky to help our residents with hazardous waste and help make each home as toxin free as possible.